Brad headed out Friday night for a guys weekend at the cabin. Friday night me and the boys were decidedly low key. Just hung out, stayed up late... vegged out. It's a thing of beauty now. Saturday night Jill came over for a BBQ. We hung out on the deck drinking vodka & 7 in the sun. Boys had a soak in the hot tub and then Jill read them bedtime stories. Sunday am, got up and packed a huge fruit and veggie filled picnic basket. 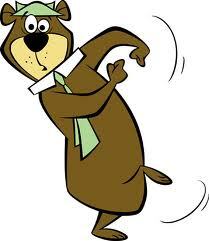 I laugh, every time I say picnic, I hear Yogi Bear in my head saying "pic-a-nic" basket! We headed out to the Nature playground with my friend Debbie and her sons Seth and Cole. After running around at the Nature playground, we found anice spot on the grassy knoll and played baseball, soccer and frisbee followed by slurpees at Macs. I decided to make BBQ shrimp kabobs for supper and was pleasantly surprised when the boys ate them up. Brad came home just in time for supper. It was a really good weekend and even more so as I didn't get myself into any pickles while Brad was away. Whoo hoo! Gold star for me.